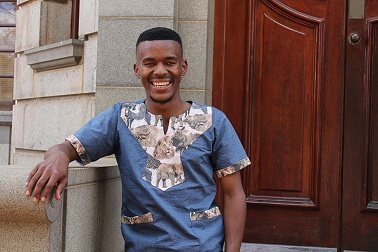 The education career of a University of the Free State alumnus and budding teacher, Sinoxolo Gcilitshane, has been given a boost after he was granted a Mandela Rhodes Scholarship to do a Bachelor of Education at the University of Cape Town this year. This prestigious offer comes after only one year of teaching experience at Petunia Secondary School in Bloemfontein, where the 25-year-old first plied his trade as an educator in English and Social Sciences since January last year. Gcilitshana, who holds a Bachelor of Education in Further Education and Training Phase from the University of the Free State, has since resigned from his teaching job. “I never imagined myself as a beneficiary of this prestigious scholarship; nevertheless, I decided to brush aside any beliefs of self-doubt about myself. I then applied, and here I am today through the grace of our Almighty,” he said. “My philosophy in life is that nobody owes you anything – not a job, not a greeting. It is therefore important for everyone, especially young people, to build their brand and to always chase excellence in all that they do – not money. Asked where he would like to see himself in five years’ time, Gcilitshane, who was the Prime of Khayalami Residence once, brimmed with excitement when he said: “Within the next five years, I hope that I will be tasked with the responsibility and special privilege of teaching at a university anywhere in the country, where I will get the opportunity to work really hard and do my research and become one of the leading scholars in my field of specialisation.” He intends going for a master’s degree after finishing this programme.